Colorful hand-woven African tribal art plaque basket, coiled style, with deep rich natural fiber colors of chocolate brown, natural, pumpkin orange and golden yellow. All handwoven over a sturdy coil base. 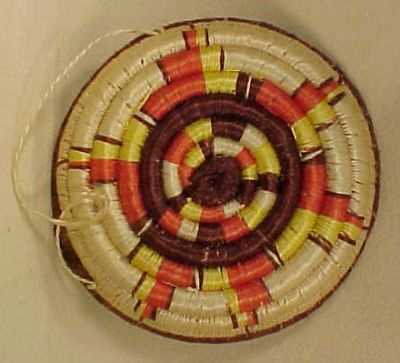 A hanging loop has been fashioned and incorporated into this woven African basket to facility hanging this basket on a wall. 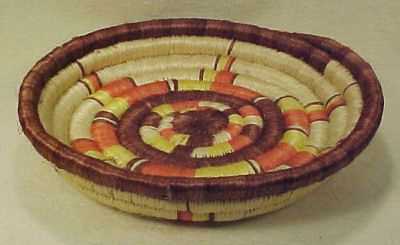 Very fine basketweaving techniques were used to craft this African coiled plaque basket. Perfect as a hanging wall basket art or to add to your collection of African handicrafts. 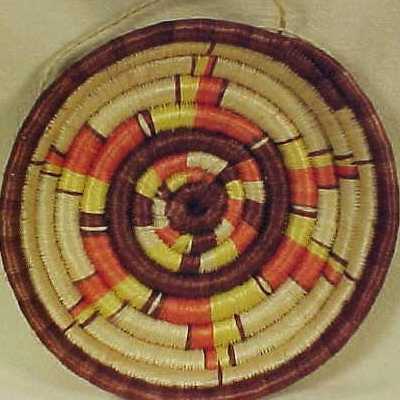 This African coiled plaque basket measures 11.5" in diameter, is 2.25" deep and weighs 1 pound, 2.4 ounces. 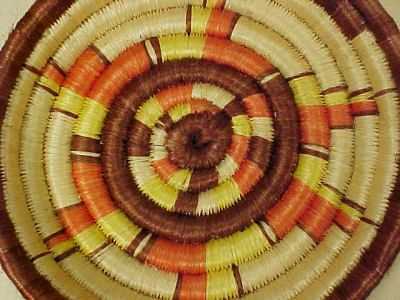 You can read more about woven African baskets and African basketry here.